Paprika is a spice made from a mixture of dried peppers such as bell peppers and chili peppers that is finely ground and provides a little punch without being overwhelmingly spicy. Sometimes at your local store you can even find a smoked paprika that has been ground in a jar. When used as a rub and combined with smoked chicken, it imparts a subtle flavor that accidents the meat and brings out the flavor of the meat. This recipe recommends using chicken breasts as it will cut down on the smoking time to just 2 to 2 ½ hours and also allow you to coat the bird with the seasoning on all sides. Soak your fruit wood chips in water. Put them in a foil pouch with holes punched in the top or in a smoker box to allow the smoke to escape out the top. These will ensure your smoke lasts longer and cut down on the amount you need to keep adding throughout the smoking process. Mix all of the chicken seasonings together including the smoked paprika in a mixing bowl. Rub the chicken with all the ingredients to evenly coat. 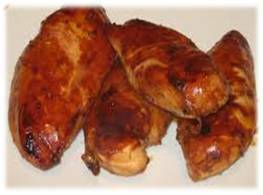 Warm your smoker to 220 degrees and place the chicken breasts on your smoker and shut your grill lid. Cook for an hour and 15 minutes.